Sunday was a great day for sailing at Coco Plum Beach; not to hot, light winds around 10 kts out of the N-NE, a good day to get into our Sunfish again without getting our muscles too sore. We had 4 sailors; Mike, Colin, Guest, Tom Reese who borrowed one of Mikes boats and Barb who used Al Simmons boat. Bob Cooley and Barb brought their outboard boat over so we had a committee boat which was great. We got in 8 races and Bob did a great job of mixing it up with half once around and half twice around. Tom led the day, showing us how to do it by winning 6 races and winning with 10 pts. Colin was second with 2 firsts for 14 pts. Mike followed with 28 pts and Barb having a very respectful 29 pt day, including 3 third place finishes. This was the first time a woman raced the entire day. Congratulations Barb! I hope we get more women out there in the future. Many thanks to Bob Cooley for bringing over his boat for a race committee and setting the marks and running the races for us. It certainly made for a very special day of racing. We hosted sailors from Ft. Lauderdale and we had 11 boats and sailed12 races. From our group, Ted Smith sailing our Club boat led with a 6th place finish. Colin followed up with an 8th place. Ted Reinhold got 9th place. Mike followed with a 10th and Paul sailing our Club boat which broke down a number of times, finished next. This past weekend was the CR 914 regatta in Ft. Lauderdale. 14 boats sailed and we got in 14 races. It was a tricky day with gusty winds but beautiful weather and mild temps. Of our group, Colin finished with 8th place. Next was Mike with a respectable 10th place. Paul followed Mike with a 11th place. Ted Smith was sailing our Club boat and had a very good finish of 5th in the 1st race. Unfortunately he had to drop out because the boat broke down. On Sat Feb. 20 our Victoria RC sailors were out in full force. It was a cloudy but mild day with 10- 20 knot winds and gusting out of the east approaching the maximum conditions a Victoria can sail in. We had 9 races and Colin was first followed by Mike, Bob and Paul. Ted Reinhold and Ted Smith sailed CR 914’s, tuning up for Sundays regatta. We all had a blast and much thanks goes out to Barb and Bob Cooley who brought their kayak so we could put out marks and to Sue Ruck for keeping score. Our newly acquired Club Victoria #79 “Bluebird” (Tom Moses boat which he donated) is christened at the Valhalla Quarry. Colin and Sue, Bob and Mike showed up for our sail on Wednesday. Sue was our race director and we got in 8 races. “Wee Lassy” sailed by Colin won with 10 pts. Mike sailing “Bluebird” came in 2nd with 13pts and Bob sailing his boat was 3rd with 21pts. It was a beautiful day with light winds and in the high 80”s. Thanks Tom for your donation. We will take good care of her! Thank you Sue Ruck for being our RD and keeping score and starts and finishes!! Yesterday Mike, Tom Reese, Al, Sue Ruck and Colin went kayaking at Curry Hammock. Conditions were pretty windy so we did not go out in the ocean, but it was just fine in the back. The sun came out for us and the water was clear. We all had a great time. Al decided to paddle on his board back to his house, and he had quite a slog with south winds on his port bow. It took him 2 hrs to get home but he made it safely. I’m sure he slept very well last night! On Saturday, March 26th, 3 sailors sailed in beautiful weather at Coco Plum Beach. Probably the most perfect day for sailing; 10-12k winds out of the SE, temps in the 85* range and partly cloudy sky. Tom Reese, Mike and myself got a bunch of races in and the results were all over, but everybody had their share of good races. The Boot Key Kayak trip was a blast. Al and Susan Simmons in their canoe were joined by three friends on kayaks and Margo, Mike and Colin rounded out the voyagers. We did the Boot Key Loop clockwise. 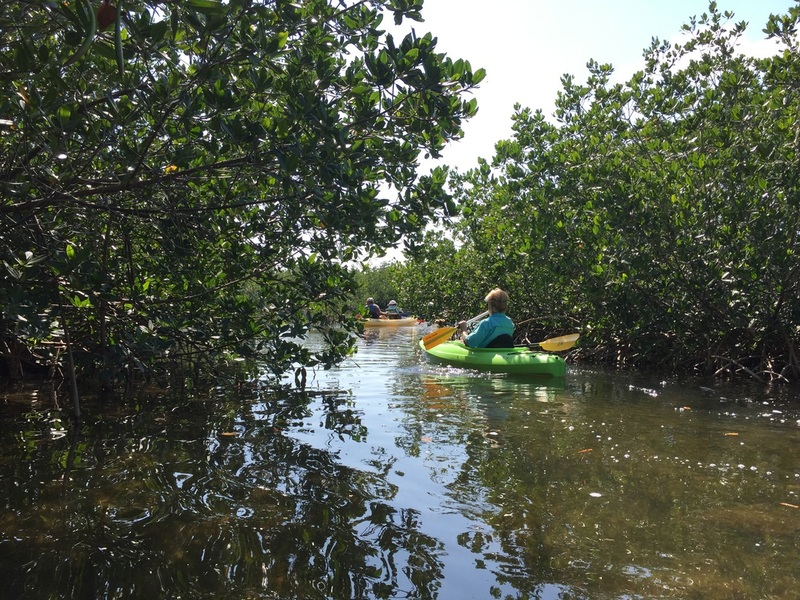 The weather and tides were perfect for exploring and poking through the mangrove tunnels. There are even some unusual animals hanging out that gave us a surprise. We got back about 5:15, a perfect 2 hour trip which I would recommend to everyone. ​Thank you Al for leading us through the maze. ​Sunday was a day for record books! A picture postcard beautiful day for our day sail on “Siesta” with winds out of the North at 10-15K. and temps in the low 80’s and not a cloud in the sky. On board “Siesta” with captain Ed Marill and his first mate (Admiral) Daisy were; Paul Koisch and Judy Rowley, Margo and Larry Murray, Sue and Tom Reese, Dotty and Tom Moses and Colin. We boarded “Siesta” a CSY- 44, at 10:00 AM at Sea Base in Islamorada and sailed toward Coffen’s Patch. It wasn’t long before drinks started appearing featuring Paul’s and Daisy’s famous FROZEN MOJITOS mixed in Ed’s on board electric mixer. Soon the food started coming out. That’s one thing we are never short of. We had a refreshing stop at Coffen’s Patch where we swam and snorkeled and fed the millions of yellowtail. Afterward, we headed back to Ed and Daisy’s house on Coco Plum and the end of a picture perfect day. 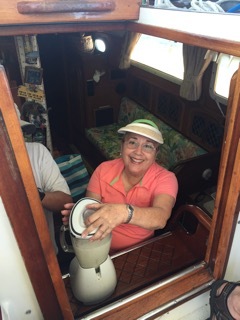 Thanks to Paul and Daisy for the delicious mojitos and especially to Captain Ed and Daisy for their hospitality and our long anticipated and much appreciated sail on the beautiful “Siesta” What a great day! !